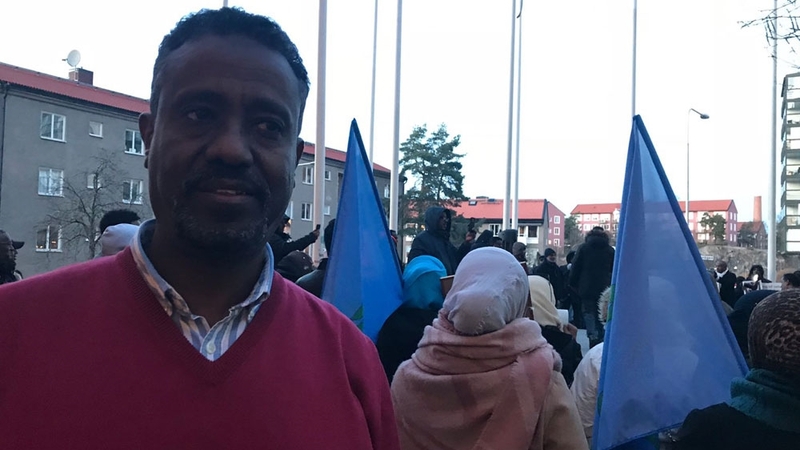 Stockholm, Sweden - Hundreds of Eritreans gathered outside the embassy of the east African nation in the Swedish capital Stockholm on Friday to protest against the recent arrest of teachers and the director of an Islamic school. The arrest of Hajji Musa Mohammednur, president of the board of the Al Diaa Islamic School, and several other teachers triggered a rare protest in the capital Asmara on October 31. Thousands marched towards the president's office, demanding the release of Mohammednur and the other detainees. Mohammednur has opposed the government's school nationalisation policy that among other strictures bans the use of hijab, a headscarf worn by many Muslim women who feel it is part of their religion, and religious education in the school based in Asmara. The policy also affects Christian schools. The arrest of Mohammednur "was the spark which unleashed the people's anger" in Eritrea and among the diaspora, Zein Shawkai, a political dissident who participated in the protest, told Al Jazeera. The protest marked a first in Eritrea since the country gained independence in 1991 from Ethiopia following a 30-year war. The Eritrean state forbids any associations and gatherings. The protesters in Stockholm included young and old Eritreans, Muslim and Christian, and a few Syrians who came to express solidarity. They chanted anti-government slogans demanding the removal of Eritrean President Isayas Afowerki: "Down, down Isayas" and "The people want to get rid of the regime". They held posters of the imprisoned Mohammednur and various Eritrean prisoners of conscience. The atmosphere turned from serious to joyous as speeches were mixed with patriotic songs. Protesters came from across Sweden, and buses were organised to ensure people made it to the rally outside the embassy in the suburb of Lidingo. Despite the freezing cold, people stood for over three hours under the watchful eyes of the police who were present to ensure no clashes would happen in case government supporters showed up. Nagash Osman, one of the protest organisers, thinks interfering with people's religious beliefs proved to be the final straw for many in Eritrea and that is what led to the protests. "They are trying to force their own rules on the people and the educational system," he said. "In telling people not to wear the cross or the hijab they are interfering in people's personal choices and beliefs." He added that the diaspora has been staging anti-government protests for the last 25 years, but what is new is increased international attention and the fact that demonstrations actually happened inside the country. Shawkai explained that international media coverage of Eritrea increased after the United Nations Human Rights Council set up an inquiry commission in June 2014 to investigate rights abuses in Eritrea. The report concluded that Eritrea committed widespread abuses that could amount to crimes against humanity. "We want to keep Eritrea in the news, we don't want to be forgotten again. We want the Eritrean story to stay alive," Shawkai said. According to Shawkai, the Eritrean regime has stepped up its propaganda and the spreading of fabricated news recently, such as claims that the protests are staged by the Muslim Brotherhood. "This is false. Muslims and Christians are standing side by side inside and outside Eritrea protesting against the regime. There is no difference between Muslim and Christian Eritreans when it comes to national identity and solidarity," said the event organiser Osman. After the protest in Asmara, Minister of Information Yemane Gebremeskel, tweeted "Small demonstration by one school in Asmara dispersed without any casualty, hardly breaking news". On November 4, an opinion piece on the official organs of the Ministry of Information claimed that the demonstrators were "a group of teenagers" chanting "Allahu Akbar". Many of the people Al Jazeera talked to mentioned the "media blackout" from inside the country. "Just give us a chance to tell our side of the story," Shawkai said. Semhar Selassie, 30, a teacher, also stressed the importance of letting non-state-affiliated voices be heard in the coverage of Eritrea. "What happened is far from having religious or sectarian motives. It is as simple as a school's basic rights being violated and unlike the previous 26 years, people didn't keep silent about a violation of their rights. People stood up to defend their basic human rights and the regime couldn't just digest this fact." Selassie said that by spreading propaganda, which could divide the people, the government is trying to divert the attention of people from the real issue. Despite the government crackdown there was a sense of hope within the diverse crowd in Stockholm. "What happened in Akhria, Asmara, on October 31 is the beginning of what will have to come. It is the sign of an end to all the silence and fear that have haunted our people for decades," she said. "The Eritrean matter is far from over, actually its active stage is just beginning."